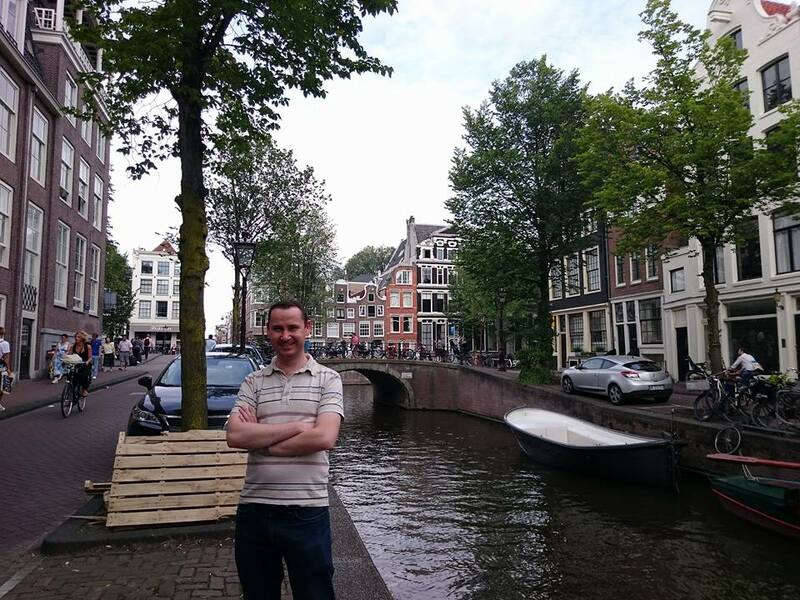 Well those that have been following this blog for a while might know that I had one challenge remaining on the road back to normality following my coeliac disease diagnosis, and that was travelling abroad again. Eating out gluten free, whilst avoiding cross contamination, can be hard enough, but when you are away in a strange place and with a language barrier thrown into the mix then the thought of travelling abroad can be more stressful than something to look forward to. Well circumstances have forced me out of my comfort zone in recent months and I’ve actually ventured abroad three times in the last four months. 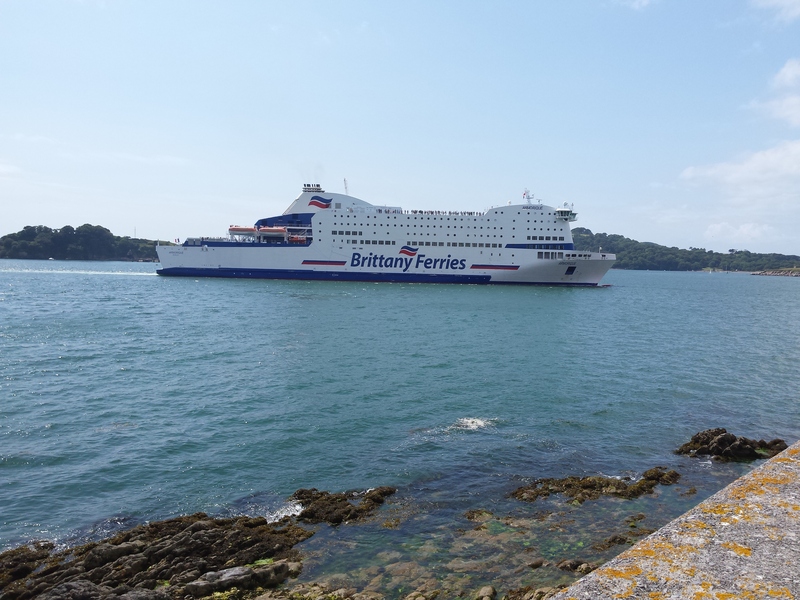 Back in May my new job took me on a fleeting visit to France to visit our Roscoff office. The visit was so fleeting that I only needed to sort breakfast and lunch on the ferry so I packed my own food so this didn’t really count as I didn’t have the challenge of finding food in France. In June though a stag do in Amsterdam over a long weekend provided a bigger test. Such was the success of this trip that I’ve actually just been back last weekend for a follow up visit with my wife, Abby. It’s fair to say we visited some of the more cultural sites of Amsterdam compared to the stag do. Anyway, I’ve been quiet on the blog recently so thought it would be nice to share some tips albeit away from Plymouth. I tried to concentrate more on the holiday than being totally food obsessed so excuse the lack of photos! I visited the Belgian restaurant Lieve on both of my visits to Amsterdam. The restaurant is centrally located in the canal belt, has a separate gluten free menu with very reasonable prices. The staff were very helpful on both occasions I have visited and there is also gluten free bottled beer available. Lieve offers an all inclusive deal where you can drink as much beer or wine as you like in two hours, which unfortunately doesn’t include the gluten free beer. It did however make this restaurant a somewhat legendary location to visit for the stag do, after we ended up with a three course meal, plus amuse bouche, sides and copious amounts of beer and wine for around £25 a head. The Euro conversion rate working nicely in our favour at the moment! But what’s more the food here was delicious too. The fact 12 lads on a stag do, and then a visit from coeliac me and my vegetarian wife have both seen happy customers says a lot I think. Also worth noting the fries are gluten free. Well worth a visit. Lunch on day two took us to a small cafe called Piqniq. Here I enjoyed tomato soup with a very tasty cheese, tomato and salami toasted Italian sandwich on gluten free bread. As with many of the places we visited in Amsterdam this was washed down with some delicious freshly squeezed orange juice. A little on the pricey side but the food was very nice and this was a perfect lunch stop which I would return to if we ever go back to Amsterdam. There was also a choice of gluten free desserts and I had a lovely piece of “Snickers” tart to set me on my way. Plus points for having a cafe cat too. On night two we met up with one of Abby’s friends at Oresti’s Taverna which was a Mediterranean tapas style restaurant. I must admit to having a bit of a panic when I arrived. 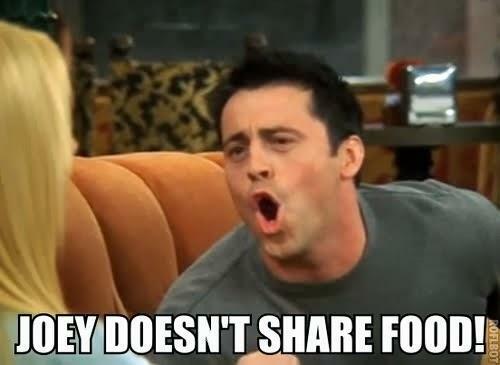 No gluten free menu, gluten free not marked on the menu not to mention it’s tapas, and well let’s face it, just like Joey coeliacs do not share food! No cider available (cider is not big in Amsterdam!) and no gluten free beer either, but I was designated a waiter who “knew all about gluten free” who was very helpful. I was provided with a really nice seeded gluten free baguette, and the waiter made a point of telling me he had served it on a plate rather than the usual bread basket which put me at ease. He helped me through the menu and ultimately I ended up with some delicious tapas at a very reasonable price. I didn’t share though! There are several Bagels & Beans around Amsterdam which are convenient for breakfast or lunch. All branches offer gluten free bagels and I had a warm ham and cheese bagel. To be honest bagels have never been particularly my favourite thing but this was pretty enjoyable. I wouldn’t say it was by any means the food highlight of the trip, but it filled a hole. I was also pretty disappointed when Abby pointed out the beans were actually coffee beans and not the exotic spicy home made baked beans I’d envisaged in my head. In my defence I am very much a tea drinker! Abby and I both agreed that La Vina was the food highlight of our trip. This restaurant is run by a coeliac and was a little bit out of the way but well worth the journey. Having arrived I was a little surprised to find out there was no gluten free menu and gluten free items were not marked on the menu. However, I was soon told I could have anything off the menu apart from the ravioli and was offered gluten free bread and a choice of two gluten free beers. Happy coeliac time! I had a lovely steak and fries which was followed up with the most fantastic dessert of chocolate fondant with dulce de leche and ice cream. It was so good I gave serious consideration to seconds! This restaurant was the most expensive we visited but the quality of the food was such that we didn’t see the price as any sort of problem. Would definitely go back. We visited Pancakes Amsterdam at the second attempt after giving up on our first visit as the line outside of people waiting to get in was massive! This is a popular place and not very big so we decided we might have more joy going for brunch rather than at lunch time. This paid off and we managed to get a table. We both ordered the gluten free pancakes which were huge when they arrived. 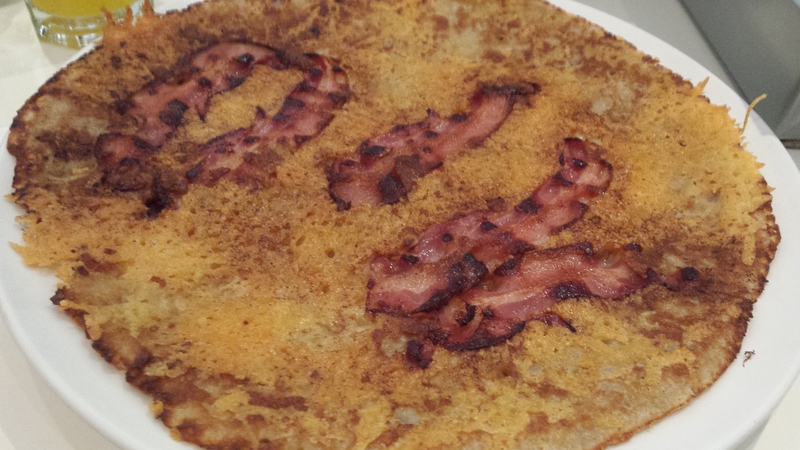 I decided to go for a savoury bacon and cheese pancake which was really really good. I demolished every last mouthful and washed it down with some more of that delicious freshly squeezed orange juice. Friendly staff and a must visit. I visited Haesje Claes on both of my visits to Amsterdam. They have a huge gluten free menu with reasonable prices and is in a good location if you are staying centrally. On both occasions I was served by the same waitress who is gluten intolerant herself (I didn’t ask but wondered afterwards if we had been assigned to her by design). I was offered gluten free bread and there was gluten free beer available. On the most recent visit I ordered a Dutch dish Hothcpotch with meatball,sausage, and bacon. 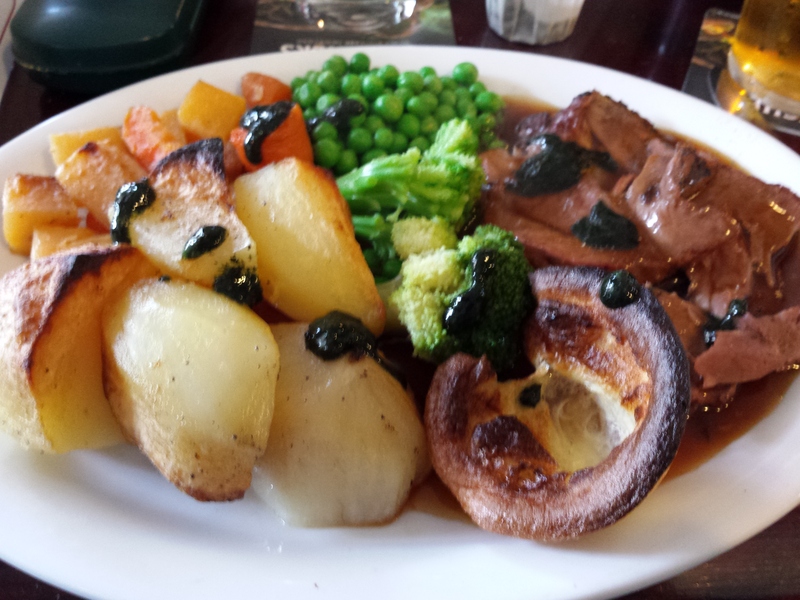 This was served with a potato and vegetable mash and gravy and I really enjoyed it. For dessert I had gluten free pancakes with ice cream and an orange sauce. Excellent meals on both visits. I was delighted to discover that McDonalds had started trilling gluten free options at two of their branches in Amsterdam literally the day before I arrived! Not only this but one of the branches was a five minute walk from our hotel. Being able to have a McDonalds made me oddly excited as I can’t say I was ever a massive fan in my gluten eating days. It’s surprising sometimes how coeliac disease can change perspectives. Anyway, being able to get a gluten free burger in a bun with fries was a great hangover help for both days of the stag do! Disappointingly I tried to visit again on the way back to the airport on our second visit but was told gluten free burgers were no longer being offered. I’ve since checked the McDonalds website was still listing gluten free available at that branch, and I’ve subsequently seen a post on a gluten free Facebook group where someone had managed to get gluten free here after I’d tried. Something lost in communication on the day I think. I reflected on the only disappointment of my two trips at the airport as I tucked into my emergency crisps. There is a supermarket chain called Albert Heijn which is prevalent in Amsterdam. They offer a decent free from section if you want to stock up on snacks or indeed to pick up a few things to take home. I managed to pick up some waffles which were really nice. It also worth mentioning Beer Cafe Gollem, which amongst their huge collection of beers did have a gluten free Mongozo beer. As said previously out of the main tourist areas getting a cider proved to be a little bit of a challenge, and surprisingly it was actually easier to find gluten free beer. Overall I’ve had a couple of great trips to Amsterdam. It’s a beautiful city that really does have something for everyone, and I wouldn’t be surprised if we end up back there at some point in the future. From a coeliac point of view I think it’s a great place to visit for a first foreign trip. So often the English are put to shame by multilingual foreign cultures, and Amsterdam falls into this category. I’d downloaded a Dutch gluten free translation card for my first visit but everyone’s English is so good there I never needed it. 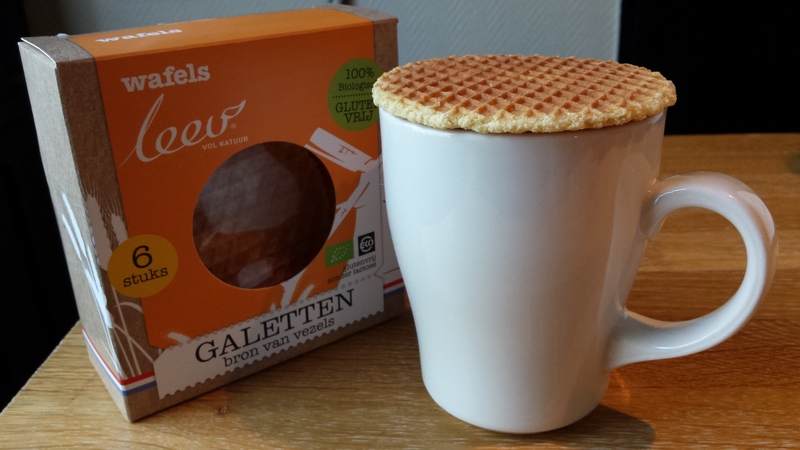 Thanks to Gluten Free by the Sea reader Louise Williams for some Amsterdam tips, as well as the authors on the blogs below. Very helpful inspiration and as always three cheers to the gluten free community for the knowledge sharing which makes our lives so much more enjoyable. Well first of all apologies for the recent radio silence. As you may have read in a previous update I’ve been going through redundancy and trying to find a new job which has been a particularly trying time for me personally. The good news is I’ve found myself a new job which I started last week and am really enjoying it. At the moment I am throwing all my energy into the new job as you would expect, so it really isn’t leaving much time for social media or blogging. Also keeping me busy lately has been the Coeliac UK Plymouth Group. 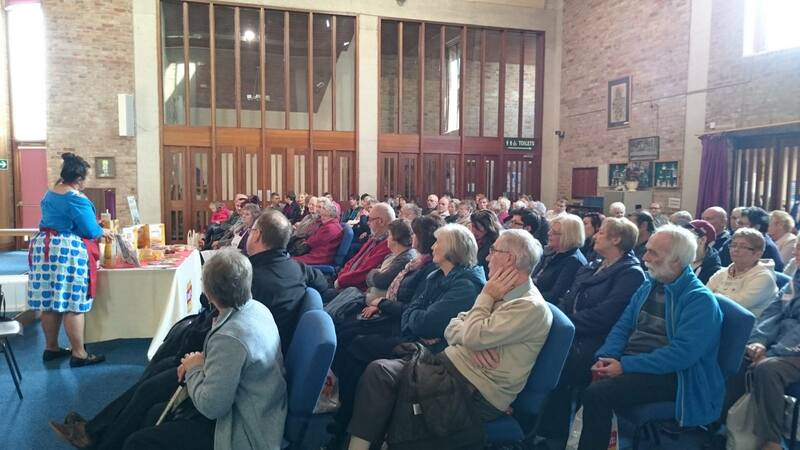 I hope those of you that were able to make the AGM in Estover last month enjoyed it. 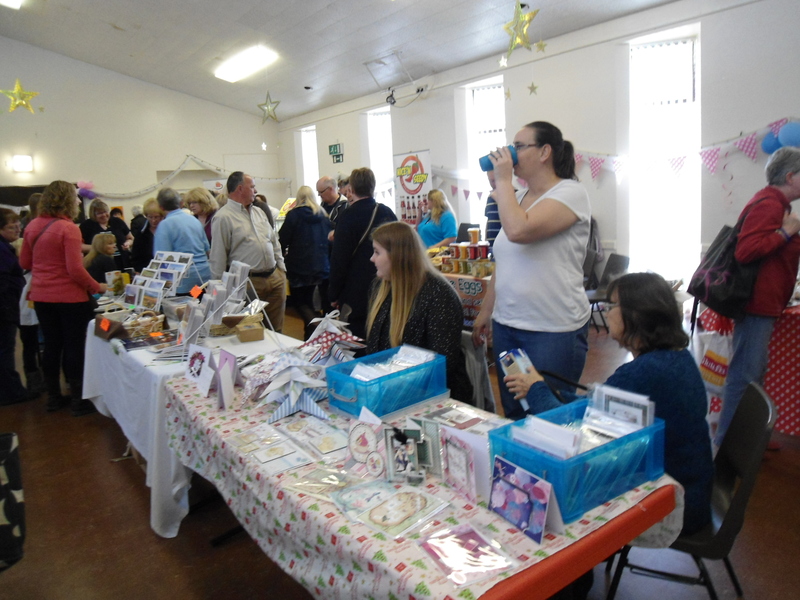 Thanks to Tamara Simmonds from Glutafin who gave a great talk on the day and those businesses who contributed to the event by selling on the day or donating raffle prizes. Unfortunately due to a lack of volunteers the group has now been suspended for six months. We are in desperate need of a new treasurer and some new committee members in order to keep the group going. If you are interested in helping then please let me know. 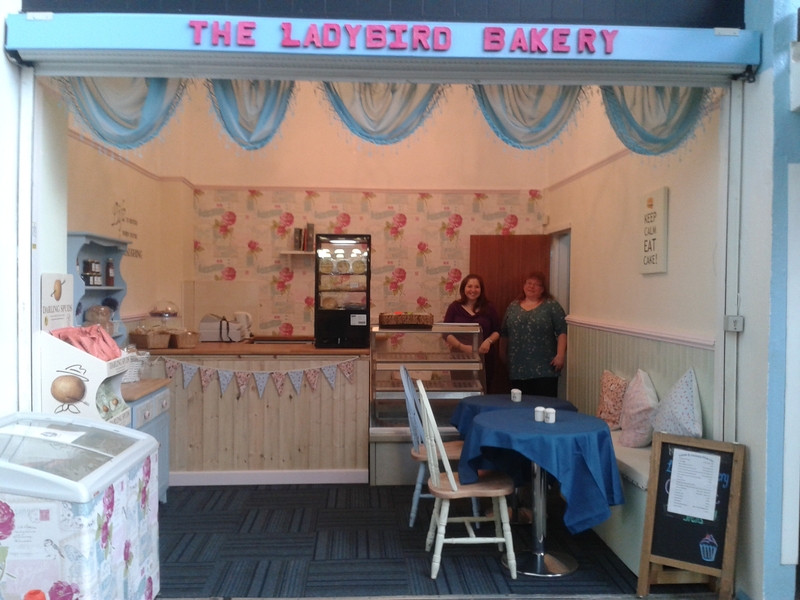 Congratulations to the Ladybird Gluten Free Bakery who have just moved to a new home in the market. As you can see from the photo below their new venue is looking fabulous and now has a small seating area so you can sit down and enjoy a gluten free cake with a cuppa and even a chat with fellow gluten free folk. Ladybird are now also selling some great products from Jackson’s Gluten Free in Torquay, and also some delicious crisps from Darling Spuds which I believe will soon form part of a meal deal. The new stall is still at the bottom of the market, turn left if entering from the Market Avenue entrance by Frankfurt Gate. In other news Ed’s Easy Diner based in the mall have now added a Coeliac UK certified gluten free menu. We are of course lucky to have a couple of great independent restaurants in Plymouth for our burger fix in JD’s Grill and Holland’s Diner but more options are always welcome, and it’s always good to have some safe chain restaurants in your back pocked when travelling. 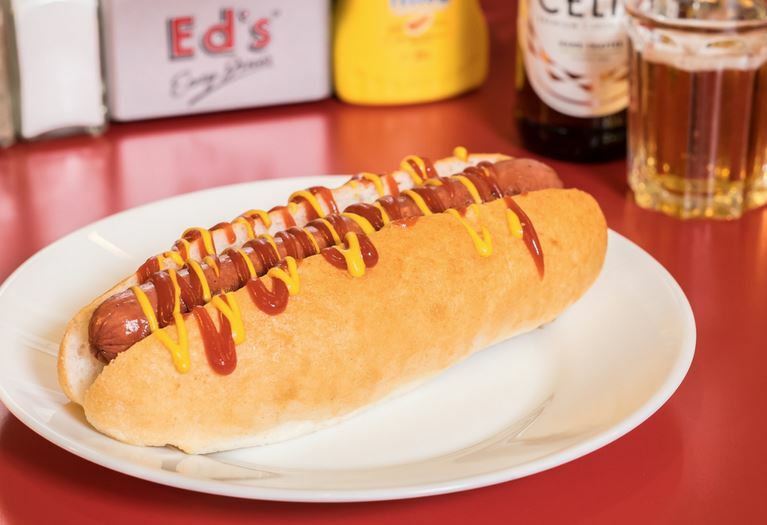 I see Ed’s are offering gluten free hot dogs which may well be a first for Plymouth. I’ve not had chance to give them a go yet, but would be interested to hear from anyone who has been in to try it out. In other news The Barbican Galley continues to go from strength to strength and have recently been able to employ a second chef. I have had many fabulous gluten free meals there recently, including a visit to their Mexican theme night. I can highly recommend the Southern fried chicken burger and the all day breakfast, not to mention the Sunday roast. A reminder that everything they serve is gluten free so if you haven’t been yet then you really must give it a try! They are also serving takeaway fish and chips (the chips are SO good by the way), which I am sure will be very handy if the current sunny weather continues. Anyway, I hope everyone is well and enjoying the sunshine. If you’ve made any new gluten free discoveries in Plymouth recently then please let me know, it would be great to share them. The Coeliac UK Plymouth Group are holding their Annual General Meeting on Saturday March 14th. Everyone is welcome to attend so I hope that I will see lots of Gluten Free by the Sea readers in attendance! There will be a talk from Glutafin and of course the opportunity to buy some amazing gluten free goodies from some local suppliers, plenty of free samples and some great raffle prizes. Please see full details below. The committee invite you to join us at the ELM Centre, ASDA Plymouth, for our AGM. A short meeting to go through the formalities of the AGM will be followed by a talk from Glutafin. There will also be the chance to buy some gluten free treats from some fantastic local companies. For new members we will be available to give help with such things as prescriptions and best places to purchase gluten free products. We are delighted that Tamara from Glutafin will be joining us this year to give a gluten free talk and update from her company. This will be followed by a great opportunity to stock up on gluten free products from some of the finest local suppliers. Let Them Eat will be present with their delicious cakes, Jackson’s Bakery will be bringing their fantastic products down from Torquay, Ladybird Bakery will be selling a taste of what is available at their new Pannier Market home and St Maurice Bakery will be selling delicious hot steak pasties amongst other things. Pomeroy Rare Breeds will again be selling their fantastic pies and Scotch eggs. We have now added Westcountry Produce to the line up and they will be bringing some fantastic looking pies, including a vegetarian range. Everything will be gluten free! Glutafin, Juvela, Newburn Bakehouse, Keep Me Gluten Free and The Black Farmer have all donated free samples for members or raffle prizes amongst others. In the Elm Centre we will have use of the excellent kitchen facilities, where Tea’s, coffees, biscuits and cakes will be available after 2:30pm. For all you bakers out there, we welcome you to bake and share with other members. There will be a £1 voluntary entrance fee to the meeting and members are also encouraged to bring unwanted prescription items for new members. We are looking forward to seeing you on the 14th March 2015. Doors will open at 12:30pm with the food fair running until 4:30pm. We sincerely hope you can attend, and trust you will have a great time. For any of you who do not know were the ELM Centre is, it is located in Estover Plymouth adjacent to the ASDA Store. If at the ASDA main entrance, turn right down the steps and the centre is at the far end of the courtyard. Full address is Leypark Court, Leypark Walk, Plymouth PL6 8UE.